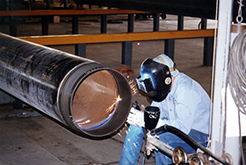 Dril-Quip stocks pipe of various sizes and grades to quickly fabricate casing joints upon customer request. Pipe stocks are kept in every Dril-Quip manufacturing facility for fast delivery around the world. Mill certificates are available for all pipe in stock to ensure quality and trackability. Dril-Quip supplies consistent and verifiable quality connectors, pipe and fabrication for turnkey casing joints. This translates into timely deliveries and cost savings for the customer.